A touching hymn written in prison by anabaptist Leonhart Sommer, December 1573, shortly before he died because of his belief. We thank You, Master and Lover of mankind, King of the ages and giver of all good things, for destroying the dividing wall of enmity and granting peace to those who seek your mercy. We appeal to You to awaken the longing for a peaceful life in all those who are filled with hatred for their neighbors, thinking especially of those at war or preparing for war. How good and pleasant it is when God�s people live together in unity! The Spirit of the Lord will rest on him� the Spirit of wisdom and of understanding, the Spirit of counsel and of might, the Spirit of the knowledge and fear of the Lord� and he will delight in the fear of the Lord. The cow will feed with the bear, their young will lie down together, and the lion will eat straw like the ox. The infant will play near the cobra�s den, the young child will put its hand into the viper�s nest. Today is the fourth (or in some calendars, fifth) day of Advent — 24 days until Christmas! Our Scripture is a beautiful passage from Isaiah; much of Isaiah foretells the coming of the Messiah. 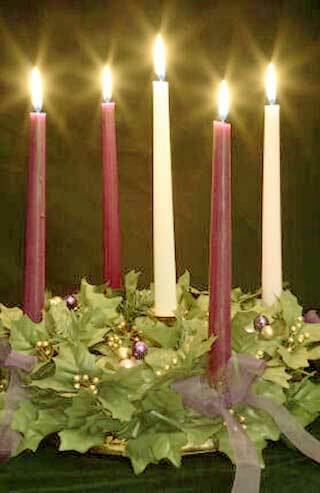 Advent is Latin for "coming" and we call the days before Christmas "Advent" because we celebrate the coming birth of Christ. He was born as an historical man and so we can be born in the Spirit. We celebrate the birth of mankind, in a sense. We prepare to welcome the arrival of a unique King into the world, as had been prophesied in Isaiah. We celebrate that the Word will become flesh, in order to give us the hope of salvation, the deliverance from sin. This period is one of excitement and preparation, for we have come to know Christ and what He has accomplished for us. He is coming to dwell among us, God is coming to walk with us as a man, a simple man, a carpenter, to whom human beings could talk and worship and with whom they could eat. He was born as a humble little baby and the people alive in that time would have seen him, just like any newborn. And we know that He will come again and all who believe in Him will see him in the full glory of His Kingdom.